The first thing to determine is it a /2 or earlyer model? 1. 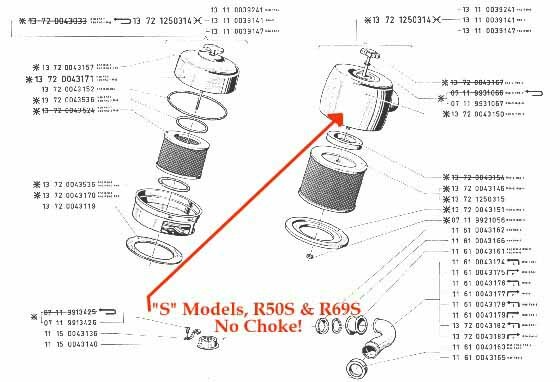 What do the shocks and the valve covers look like? If the shocks are low and the valve covers look like the one in the picture below, chances are it is pre 1955 or possibly prewar... that is, made before World War II. 2. What kind of drive shaft does it have? This shaft is open, no enclosure. 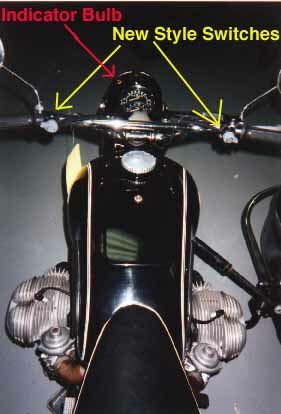 Slash Two's have an enclosed shaft drive. 3. Is the engine mostly enclosed in a smooth housing or is the starter exposed? Slash Two's have the starter enclosed on the top of the engine. 4. Early Slash Two's have Earls' Forks. Those "L'' shaped forks. But some later "US" Slash Twos have Telescopic forks so this is not a sure fire test of Slash Two-ness. 5. Don't forget we are talking about Twins here. If it is a single It is probably a R26 or R27. I hope to make a page on these in the future. Waaaay Old! This is a Plunger Frame from the 1930's ! Ok, if you passed those questions I guess you have a " /2 ". How do we tell those apart? We must stop now and discuss what "/2" means. The SLASH TWO is simply a update or revision of the model. 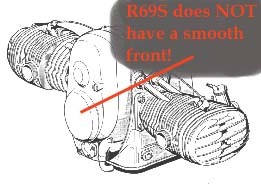 For example an R50/2 is an newer R50 with some bug fixes. Although somewhat incorrect most people call all of these modles SLASH TWOs. I tried to hold out but I fell into the habbit myself just for ease of use. First check the valve covers. 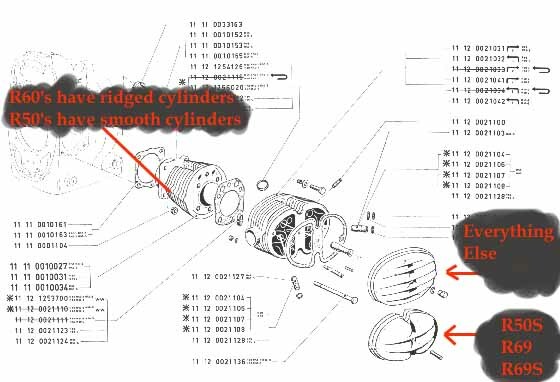 Though this is often unreliable (due to the interchangeabilty of these often damaged parts) it is a quick start. Then check the cylinders. Next, the air filter housing. 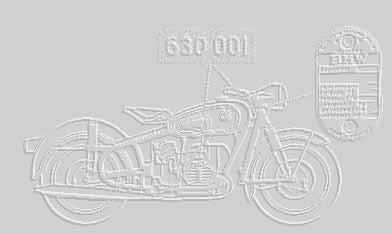 Ok, now is it an R50 / R60 or a R50/2 or R60/2 ? If it has large headlight and horn switches chances are it is newer than 1960 ( likely a /2 ). These switches look like the ones on the /5 models. If it needs clamp-on mirrors, then I suspect it to be pre-1960. And lastly, check the rear end numbers. 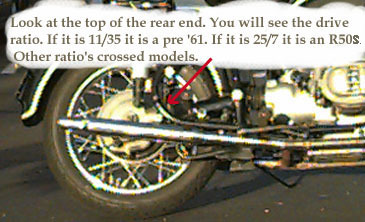 Numbers on the top of the final drive may indicate the age and model if original and was never setup for a sidecar rig. If you still do not know what model you are looking at, I can not help you. You will need to check the serial number or find a better educated source than myself.